The Memorial Court was hollowed out (with the boys doing the digging) and the war memorial erected after the First World War. 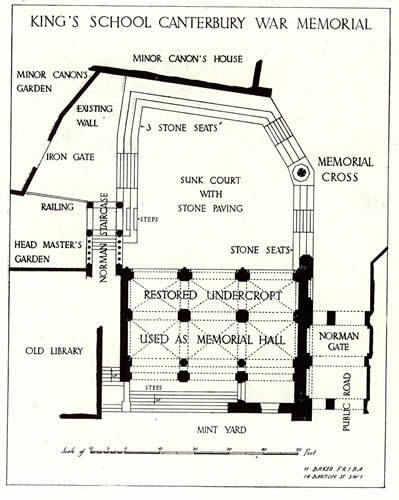 The original plan was for all three arches in the undercroft to be part of a memorial hall. In the event, the school tuck shop – later the Memorial Chapel – remained in place. The memorial now commemorates the OKS who died during the two World Wars, and their names are listed on two plaques in the undercroft beneath the Schoolroom. Full details can be seen at King’s School Roll of Honour. The Remembrance Day service is held here.